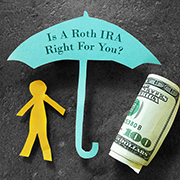 Should you incorporate a Roth IRA into your retirement savings program? Roth IRAs offer significant tax advantages, if you’re eligible to make annual contributions or if you convert a traditional IRA into a Roth account. Today’s comparatively low federal income tax rates under the TCJA provide an extra incentive to consider the Roth conversion strategy right now. Contact your tax advisor to help understand the pros and cons of Roth IRAs and Roth conversions under the new tax law.